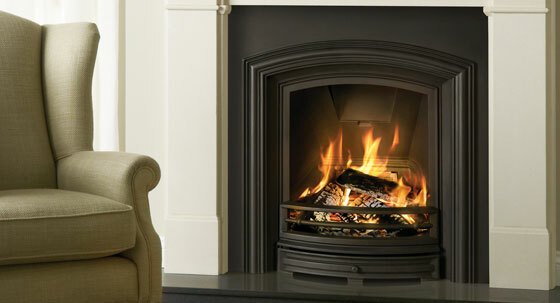 Stovax's range of stunning insert fireplaces can bring period charms to traditional and contemporary homes alike. 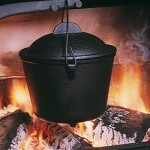 During the Georgian and Victorian eras, the fireplace took became an increasingly important part of the home. No longer just for heating and cooking, the fireplace became a decorative statement of wealth and taste. Stovax and Gazco’s fireplace insert designs recapture the aesthetic appeal of period pieces and combine this with 21st century technology. Whether you have a period property, or you wish to bring a piece of the past to a new home, you can find an authentic fireplace insert to add grandeur to your living space. 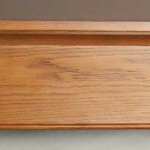 Fireplace inserts have in-built firebacks and can be placed into chimney openings measuring approximately 36” x 36” or larger. 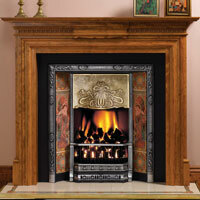 A Stovax fireplace insert can be made entirely from cast iron or incorporate decorative tiles. 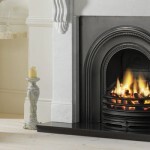 For increased convenience, the fireplace inserts are also available as realistic coal-effect gas fires, bringing all the look of a traditional fireplace insert along with the ease of gas. The earliest influences on Stovax’s fireplace insert designs can be found in the early 19th century, with the Kensington & Knightsbridge fireplace inserts exhibiting the beautiful symmetry of neo-classical designs, making them ideal for a Georgian drawing room or modern home alike. The Victorian Tiled fireplace insert is based on designs from the late 19th Century and offer a wide range of tile and hood options that can be paired with Stovax’s Victorian tile range. Our tiles are faithfully reproduced from Victorian originals, in a range of designs that display the interest in nature and love of symmetry found during this period. Our Art Nouveau tiled fireplace inserts capture the flowing design motifs popular at this time, and the optional brass hood can add real panache. For the tile sets, choose from recreations of renowned Art Nouveau artist Alphonse Mucha’s work, or tube-lined tiles, produced using traditional hand-crafted methods. Following the cluttered interiors of the Victorian era, Edwardians favoured understated elegance, a preference that is continued with the Alexandra fireplace inserts. Whether you select Matt Black, Highlight Polished or Fully Polished cast iron as your finish, the Alexandra will bring sophistication to your living space with its authentic hand-cast detailing and graceful curving arch. To find out more about the wide range of beautiful fireplace inserts that can lend classic appeal to your home, contact your local Stovax retailer. 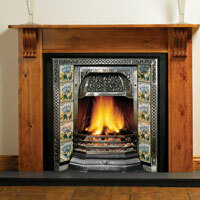 The fireplace insert is necessary for safety and also its looks decorative. 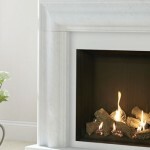 The fireplace insert product makes your home safe from heat and also it is also available in different size and design. Stovax wood burning fireplace on display at the Ideal Home Show!